Birds have evolved some very strange features and behaviors in order to woo mates. Birds-of-paradise feathers are a natural vantablack. Bowerbirds build elaborate and colorful nests. And it seems that Costa’s hummingbirds control how females hear the sound of their dives. 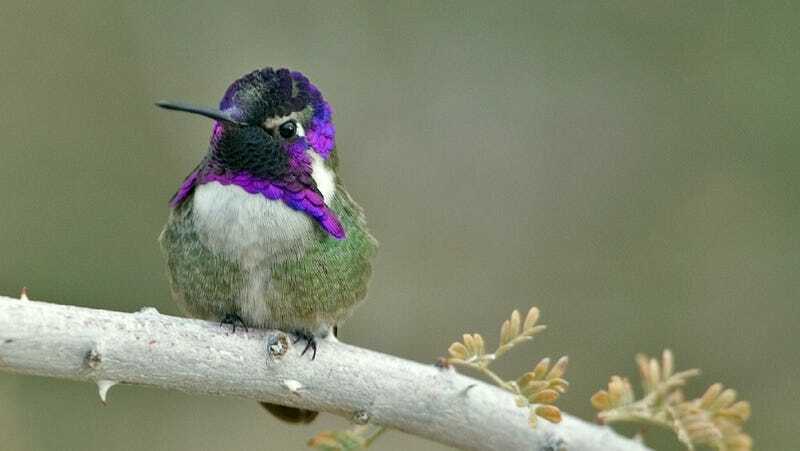 A pair of researchers at the University of California, Riverside studied six hummingbirds in an acoustic wind tunnel as they danced for a female in a cage. Confusingly, the birds dive to the side of, not in front of, the female. It seems the males are actually tweaking the sound of the dive so it seems like they’re going quickly—a sign that they’re fast flyers and a worthy mate. Clark and Emily Mistick watched hummingbirds perform their dives in the wind tunnel and measured the sounds and the direction they came from with microphones and acoustic cameras. These are devices that can image a sound, its intensity and source. Teeny male hummingbirds typically control some sort of territory, explained Clark. Once a female enters, the male will attempt to put on his display. With some species, the birds will fly over the top of the female, or in a way that shows off his feathers. But Costa’s hummingbirds fly in four-meter dives to either side of their love interest. The males ultimately want to demonstrate that they are physically fit specimens, and do so by showing the females how fast they can fly. But there’s an upper limit to speed, so instead, they can just make it sound like they’re going faster. They do this by masking the changing pitch of their sound caused by the Doppler shift, according to the paper published today in Current Biology. In other words, flying to the side masks the neeEEEEEEooww sound you might associate with a diving airplane. Changing his dive angle can mask that he’s cheating. Additionally, said Clark, he’s pointing his tail feathers towards the female, so the sound is also louder—the faster he goes, the louder the sound would be. This is just the first of plenty of hummingbird studies, said Clark. They still don’t know how the females actually react to different combinations of loudness and pitch, and whether she’s gauging loudness, pitch or some combination in her assessment. “What’s going on inside the females head is just a interesting is what the males are doing,” said Clark. Another researcher, Sarah Lipshutz, PhD candidate in Ecology and Evolutionary Biology at the University of Tennessee, Knoxville, said the paper was exciting “because it integrates the fields of sexual selection, communication, and biomechanics to examine the mechanisms underlying a dynamic male sexual signal.” She agreed that assessing the female’s response would be an important next step. 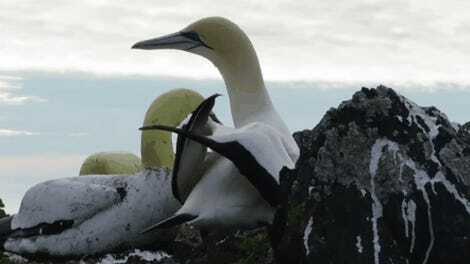 Sexual selection has made birds evolve some pretty strange behavior, it seems. But I guess it’s not so different from what males of a certain clothed primate species will do to attract a mate.